Here's a pic taken in the Recovery Ward. Still alive, head spinning slightly. Throat very dry from local anaesthetic and still on a drip, saline. Had a little nose-bleed probably from the tube they pushed down there. 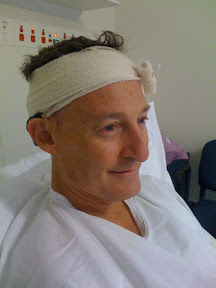 Good thing I did all that swimming - given me a bit of strength against the surgical onslaught I think.